Motoryacht Grey Matters recently came up for sale with an asking price of $10.995 million. She was built by notable yard Palmer Johnson, and last saw a refit in 2016, when the ten-year Lloyd’s survey was also completed. Grey Matters was designed by Nuvolari and Lenard; her exterior architecture boasts the kind of aggressive, sporty look that Palmer Johnson executes so well. Blount and Associates are responsible for her naval architecture; she features an aluminum hull and superstructure. Cruising speed is 14 knots and top speed is a considerable 26. The latest update includes new teak decks throughout and a full refresh of her interiors. The result is bright, contemporary, and markedly elegant. Plank hardwood flooring and dramatic figured trim complete the undercurrent of unmistakable but understated luxury. Subtle deco touches throughout add a bit of history. The living spaces neatly avoid any confining compartmental feel; her living area and lounges are broadly open, and her salon boasts a massive array of windows. Her galley is large enough to be suitable for catering, with six new custom SubZero refrigerator/freezers. 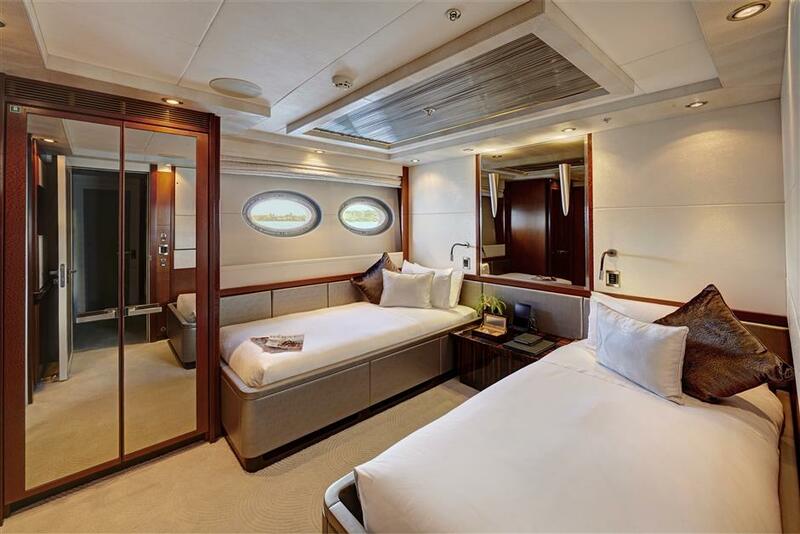 Grey Matters sleeps 10 in five staterooms and has accommodations for eight crew. She is offered with a full complement of water toys, including an 18’ Castoldi Jet tender. A great opportunity to acquire a charter-ready top-end leisure yacht from one of the most reputable yards in the world.